Christmas, Channukah and so many other celebrations of love and life are also occasions for “re-memory” as the novelist Toni Morrison calls the act of remembering in a reflective way. In my own case, I rememory the Christmases of my childhood, when my grandparents were alive and their house was a fairyland of lights and ornaments, and Christmases with my father, who was the most expert of turkey-carvers, and who died suddenly when I was only 31 years old. These memories are part of who I am. Every Christmas brings me back to my grandparents and my Dad. In that sense, they have achieved a kind of immortality, living on as they do within me. This short piece on THE VAULT is inspired by the importance of rememorying not only the famous thoroughbreds, but also those whose contribution to the sport — and our passion for it — was as great. I would also like to take this opportunity to thank each and every one of you who have given THE VAULT your support. I have received wonderful comments from so many readers! Special thanks to Steve Haskin who, busy as I know he is, always takes the time to drop me a note of encouragement each time I publish a new article. I have also to thank photographers extraordinaire Lydia Williams (LAW), Barbara Livingston, Bronwen Healy, Amber Chaflin, Emily Shields and Lindsey Ames Sanquenetti for so generously sharing their beautiful photographs with THE VAULT and its readership. I have wanted to celebrate my passion for thoroughbreds and the sport since I was a little girl. THE VAULT has made this dream possible through readers like you and the wonderful photographers whose work has so enriched the writing. I wish each of you a very Happy Channukah, a Merry Christmas and a Happy New Year. May the holidays bring you joy and laughter, the company of friends and family and good tidings throughout 2012! The magnificent Molasses Bill and his trainer, pictured here in 1946. I am a collector of thoroughbred photographs, something that started about twenty years ago with the desire to track down an actual photo of one of my equine favourites, Terlingua, Secretariat’s daughter and the dam of Storm Cat. It was a modest goal at the time. Since then, my collection has exploded to epic proportions. Such is the course of any passionate pursuit: it starts by timidly entering into the dance and, before you know it, you are dancing out your joy each and every day! In the course of searching out collectible photographs, I have come across legions of thoroughbreds who never hit the headlines more than once or twice in their day, if at all. Their names could fill an encyclopedia: Ned Reigh, Amazing Princess, Novelty, Thanksgiving, Savage Beauty, Quando, Pot O’ Luck, Merry Pete, Street Song, Sorteado, Battlin’ Satin, Famous Victory, Casual Friend, Billionaire, Staffordshire, Monte Carlo, Gosum, Mowsatre. I stumble upon these equine ghosts because I am hopelessly in love with early horse racing photography. It captures a golden age in a completely different visual sensibility that is hard to generalize. But from what I have gleaned over the years, the pre-1950 horse racing photographer was more interested in communicating the reality of the sport than in getting a perfect, promotional image. Accordingly, among the more conventional track photos abound images of “ordinary moments” in the lives of the thoroughbred, his/her trainer, jockey and groom. These oldies are so compelling, so charming, that it is tough to resist them. When a photo captures my imagination, I spend a little time trying to research its equine subject — often, to no avail. The records of these obscure athletes — the colts, fillies and geldings who worked hard on racetracks throughout the USA and Canada, but who never gained superstar status — together with the biographies of their trainers and owners, elude even the most skilled researcher. While horses like Man O’ War, Seabiscuit, Exterminator, Citation, Secretariat, Ruffian, Rachel Alexandra and Zenyatta are irreplaceable as ambassadors of our sport, its history is writ large at the uppermost levels of equine society, a little like Shakespeare, whose plays focused on the lives of the aristocracy. The Belmonts, Whitneys and other founding racing dynasties were the focus of much record-keeping and writing in the past and that trend continues today. The reason is obvious: we ordinary folk are more fascinated by the lives of the greats than we are the daily drudgery of the common hoard . Understandable, to be sure. But what happens in the wake of this cultural tradition is that history sustains huge gaps in its very fabric and, consequently, becomes distorted. 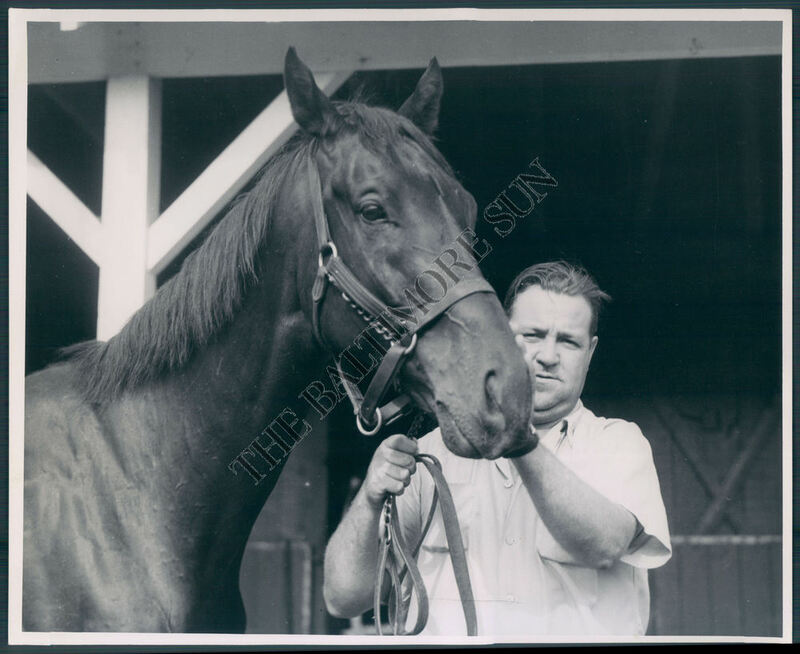 So it is that the stories of racing communities and their horses become lost to us forever, as witnessed in the mountains of old press photos that depict thoroughbreds whose names mean nothing today. Prancing onto the modest tracks that proliferated throughout the land, with all the pomp and circumstance of soldiers going into battle, these “forgotten” thoroughbreds were the true ambassadors — and heroes — of the turf. It was they who brought the magic of horse racing to millions of people, making it possible for the working man or woman to participate in the sport of kings. Enter Molasses Bill (1933) and Jimmie (1941). 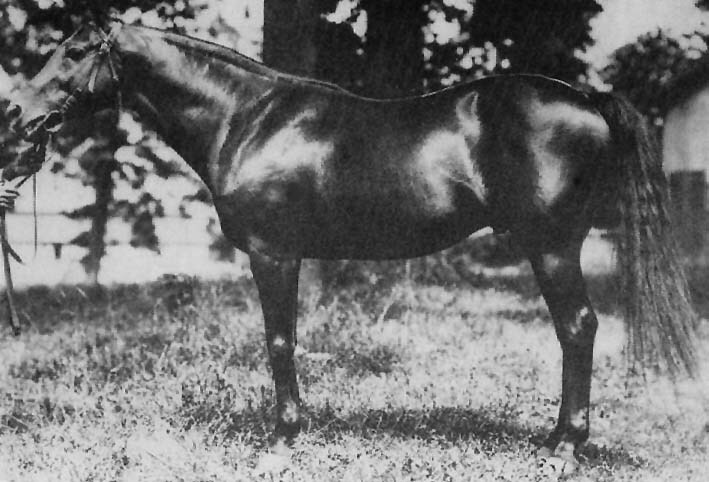 Molasses Bill was an elegant dark chocolate gelding, a son of Challenger II (1927) out of a mare named Molasses Jane (1926). 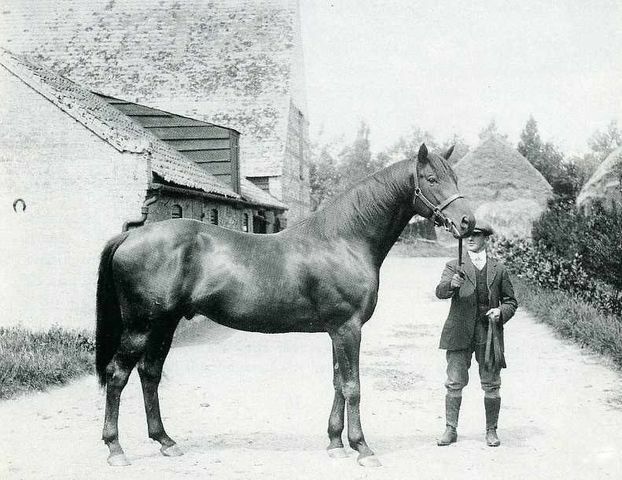 The colt was bred and raised at Branncastle Farm, owned by William Brann, the breeder of Challendon and owner of Gallorette. 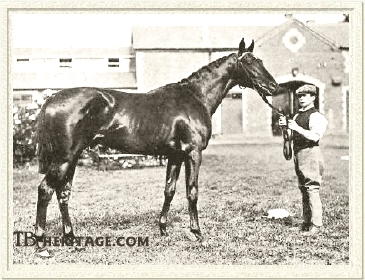 Challenger II was a son of the great British thoroughbred, Swynford (1907) who won 8 of his 12 starts, including the St. Leger and Eclipse Stakes, and sired Blandford, St. Germans and the great Saucy Sue, winner of the Oaks and 1000 Guineas. 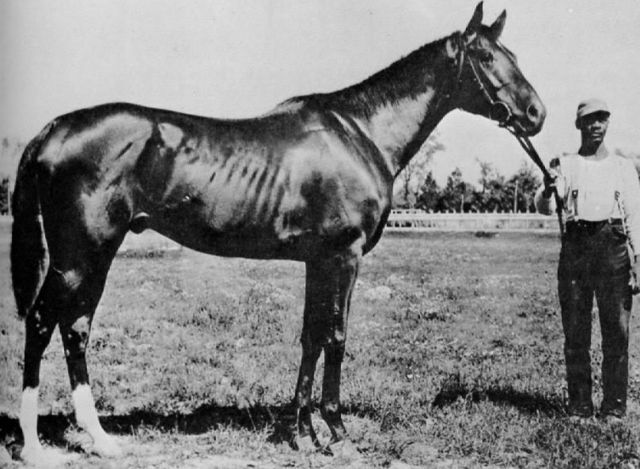 On his dam’s side, Molasses Bill boasted the ancestry of Domino (1891) and Commando (1898), as well as Ben Brush (1893) — the sire of Regret, the first filly to ever win the Kentucky Derby — and Ben Brush’s son, Broomstick (1901) — all brilliant race horses. Domino, one of the greatest thoroughbreds who ever lived. The incomparable Ben Brush, a champion on the turf and in the shed. 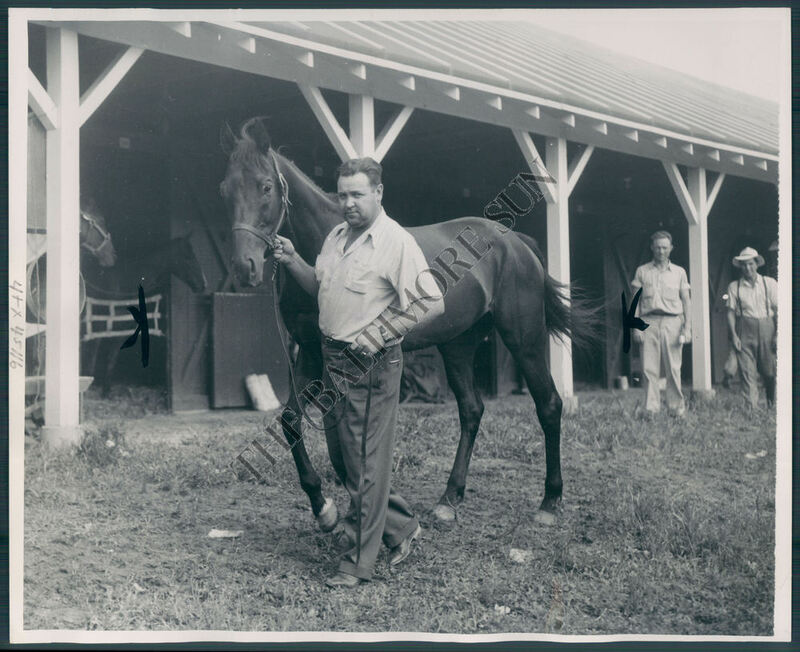 Feel the pride: Molasses Bill and his trainer, George Alexandra. Owned by E.D. 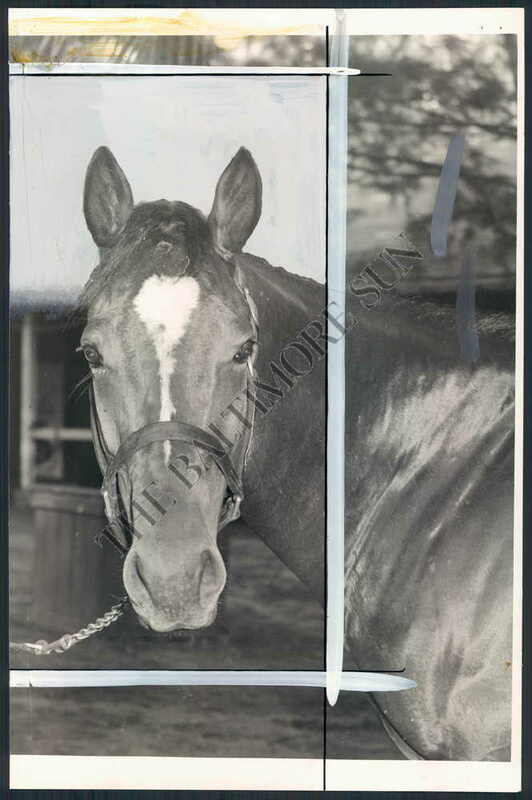 Slavin in 1938, Molasses Bill changed hands at some point thereafter since, by 1944, his owner is a Mrs. Winston W. Adams and his trainer is George Alexandra. Whether or not the gutsy gelding was always trained by Alexandra could not be determined. However, we do know that Molasses Bill also campaigned at Suffolk Downs and Narragansett Park and records suggest that the former may well have been his home base. In 1942, as a 9 year-old, Molasses Bill won 3 races in a row. Still running at the age of 16, the son of Challenger II raced 16 times, with 4 wins, 2 places and 2 shows. 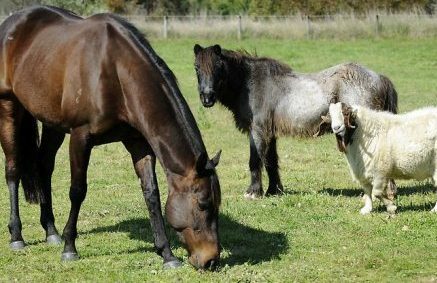 The gelding was deep through the heart and, it would seem, never gave up without a battle even when he was a senior competing against babies. In the very few accounts that are extant, it would appear that his mettle was not only respected, but also gave him a following of devoted fans from Montreal to Suffolk Downs. What became of him after his retirement is unknown, but one finds oneself wishing that he was treated with the deep respect he so richly deserved in his old age. Molasses Bill leads the field home (1946). On the back of this photo is noted: "Some people say that he actually stretches out his nose near the finish line!" Another grand campaigner was a chestnut gelding named Jimmie (1941), by Chance Play (1923) out of Nursemaid (1928). Jimmie was a homebred of a Mrs. Roy Carruthers of Versailles, Kentucky. Jimmie’s bloodlines are as distinguished as those of Molasses Bill. 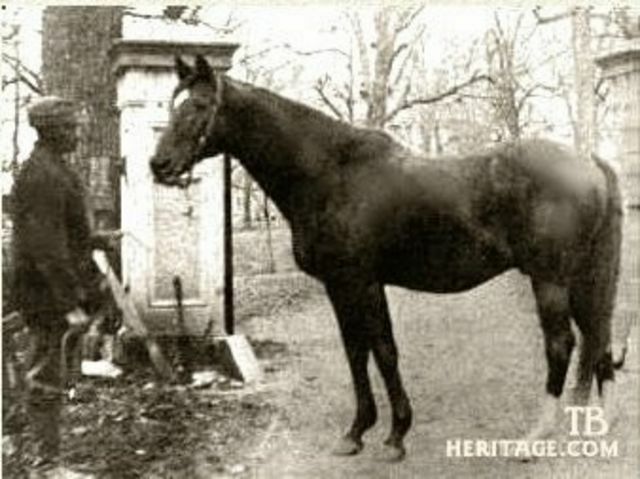 As a grandson of Fair Play (1905) and the mare Quelle Chance (1917), Jimmie’s pedigree on top boasts the names of the brilliant and bad-tempered sire, Hastings (1893) and of Spendthrift (1876), the Belmont winner and accomplished “mudder,” together with Australian (1858) the leading sire and founder of the Fair Play line. 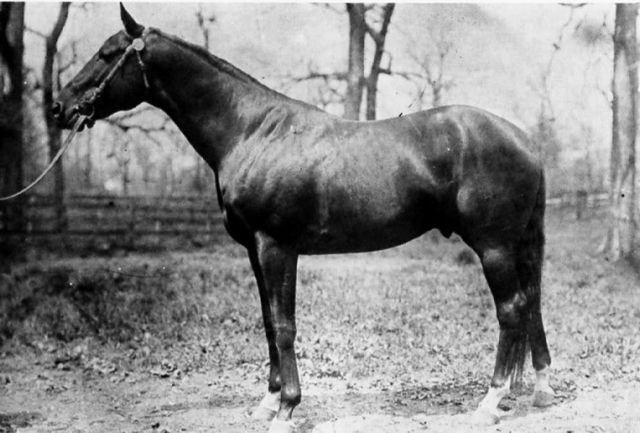 Bend Dor (1877), a son of Doncaster (1870) and the excellent broodmare Rouge Rose (1865), as well as Rock Sand (1900), the broodmare sire of the incomparable Man O’ War and winner of the English Triple Crown in 1903, round out Jimmie’s blue-blood ancestry. Only paintings of Australian exist, of which this one is arguably the most famous. A fuzzy image of Spendthrift and his groom. The beautiful Rock Sand pictured at his stable in England, after winning the British Triple Crown. 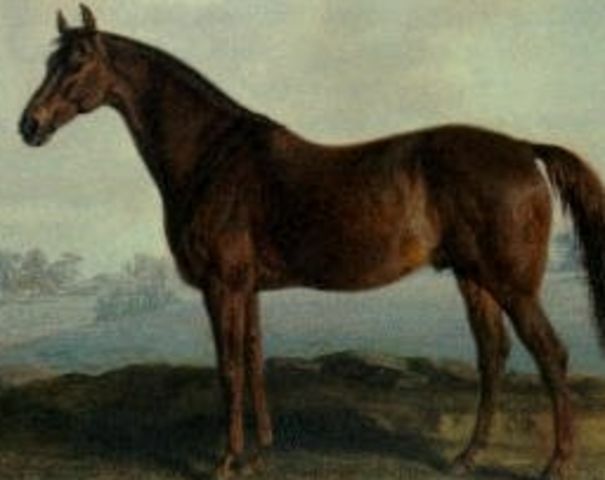 Jimmie’s racing career is as hard to track down as that of Molasses Bill, although extant pedigree information declares him to have been a black-type winner. We do know that Jimmie made a total of 95 starts, winning 21, placing in 15 and finishing third in 11, with lifetime earnings of over $60,000 USD, the equivalent of roughly $611, 600.00 USD today. Jimmie actually got a headline on June 30, 1945, when he was the second choice to the favourite, Amber Light, in the $10,000 Cadillac Handicap at the Detroit Fair Grounds. His second-place ranking was based on the fact that Jimmie had run second to the same horse earlier, in the Boots and Saddle Handicap. Sadly, despite our best efforts, the results of the Cadillac Handicap could not be found anywhere. However, a year earlier, Jimmie qualified for the $25,000 added Chesapeake Stakes and in an article in the April 1944 DRF, the inference is that Jimmie deserves to be there. Jimmie’s second headline appears in the DRF in April, 1944 — “Jimmie Convincing Winner At Pimlico” — in which he “dusted off” the other 3 year-olds in a win that was seen to qualify him to be entered into the Preakness; Jimmie covered six furlongs in 1:14 and change and had to be eased up after the finish. 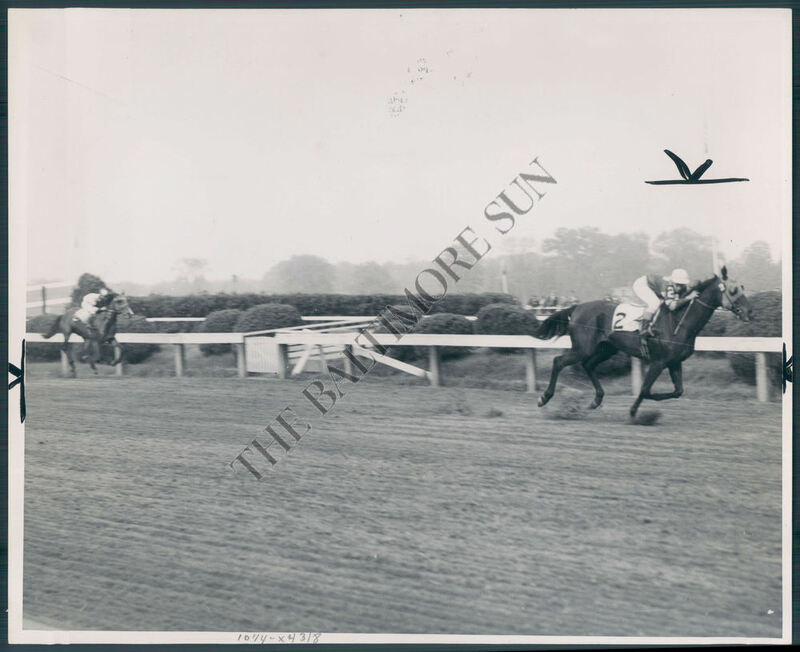 Racing at Pimlico in late May of 1945 for his owner, Mrs. Carruthers, Jimmie fought hard to finish in 4th place against a longshot called Harford. At Havre de Grace in April of 1946, Jimmie is up against three very good colts — Warren Wright’s Pride, Pentagon Stables’ the Doge and H.L. Straus’ New Moon. 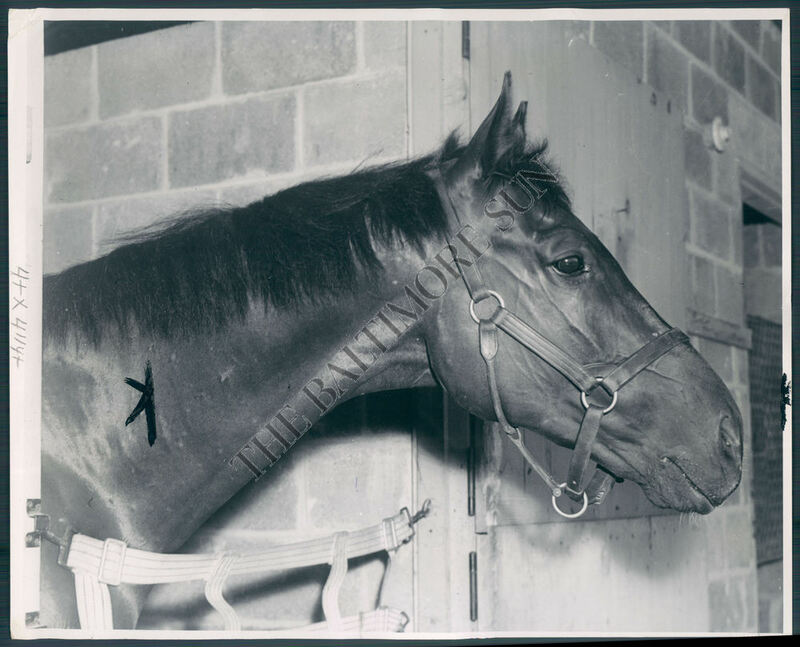 In June of 1948, Jimmie is entered in a claiming race at Delaware Park, but in May of 1949, the gelding is one of the top picks to either win or place against a horse called Dr. Roche in a column in the DRF entitled “Havre de Grace Selections.” At this point, Jimmie was an 8 year-old, which might explain why further information about him is scant. One hopes that, as a homebred, he was retired to live out his life under Mrs. Carruthers’ care but, like Molasses Bill, there is no information about Jimmie after he was retired. What, you may ask, does all of this have to do with the spirit of the season? Surely the Spirit of Channukah and Christmas showcases a moment in time when the lowly creatures in a stable and a handful of ordinary folk rose from obscurity to greatness, the former in the presence of a baby who would devote his life to bettering the lives of all people and the latter, due to a resolve, hope and faith so great that they were willing to stand firm against impossible odds. And, although we don’t know the names of the brave who brought Channukah to us, or of those lowly beasts in Bethlehem, we honour their memory. The Molasses Bills and Jimmies are the source of The Narrative of horse racing — they are the current in a river of stories, hopes and dreams that carried us forward to the community of today. Tattered though their stories may be, when we share in the re-memory of these two gallant geldings and the people who loved them, we do honour to the other “forgotten ones,” without whom there would be no memories of a Golden Era of horse racing — and no desire to support and protect a noble tradition. Season's Greetings from Molasses Bill (above), Jimmie and THE VAULT. p.s. I am proud to say that I own all the press photos of Molasses Bill and Jimmie that appear in this article. One day soon, they will be framed and mounted along side my beloved photo of Will Harbut walking Man O’ War. I like to think that both Will and the first Big Red would understand — and would welcome their place in thoroughbred history. Australian thoroughbred horse racing has known its own share of champions, some of whom are well-known around the world: Phar Lap, Carbine, Kingston Rule (a distinguished son of Secretariat) and the incomparable Makybe Diva. Aussie thoroughbreds race on the grass, in the tradition of Great Britain and Europe. 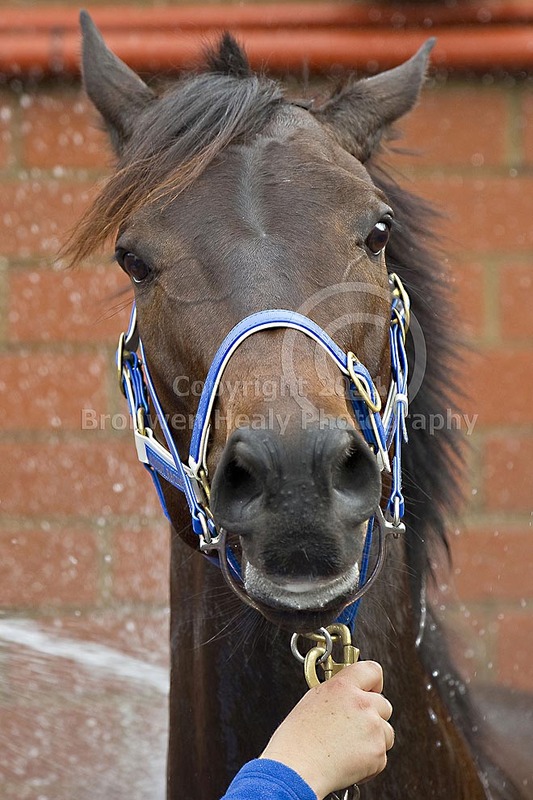 Nelly, aka Black Caviar, feeling feisty after a bath. To those who know her best, she’s Nelly. Yup. A thoroughbred whose reputation has garnered her a worldwide following is just plain Nelly to her trainer and handlers — even though they know that she’s a once-in-a-lifetime horse. And they’re enjoying every minute of her career, from her morning swims to her blazing down the homestretch to her repertoire of equine antics and daily routines. 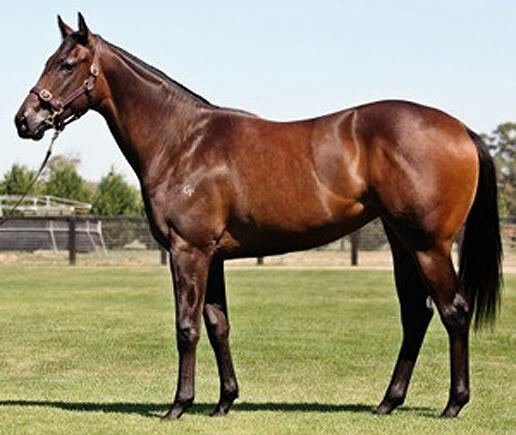 The beautifully-conformed yearling daughter of Bel Esprit (1999) and Helsinge (2001) was consigned by Swettenham Stud in 2007, selling for A$210,000 ($ 216,000 USD) to a group of owners: Mr G J Wilkie, Mrs K J Wilkie, Werrett Bloodstock Pty Ltd, Mr C H Madden, Mrs J Madden, Mrs P A Hawkes, Mr D M Taylor, Mrs J Taylor. 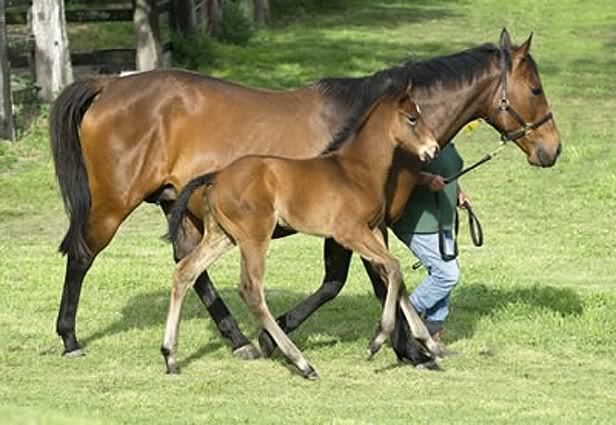 Swettenham Stud is one of Australia’s primary stud farms, begun by the late Robert Sangster, business tycoon and thoroughbred owner-breeder who’s breeding program produced super-sires Sadler’s Wells and Zabeel. Following Sangster’s death, his son Adam took over the Australian branch of Swettenham and it was there that little Nelly was born in 2006. The filly was the first foal of Helsinge, an unraced daughter of Desert Sun (1988), a son of the superlative sire Green Desert (1983) and grandson of the mighty Danzig (1977). Phenomenal as Danzig was as a sire and broodmare sire, Green Desert has been equally impressive at stud. 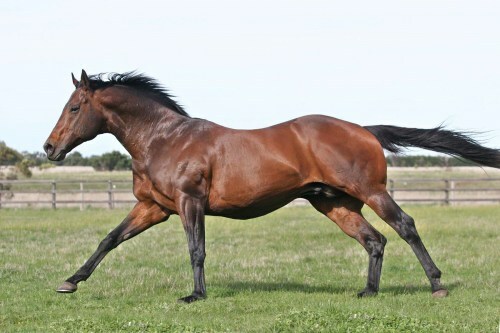 The feisty stallion, pensioned in 2010, is a sire of sires whose sons include the incomparable Cape Cross (sire of Sea The Stars), Oasis Dream (sire of Midday). 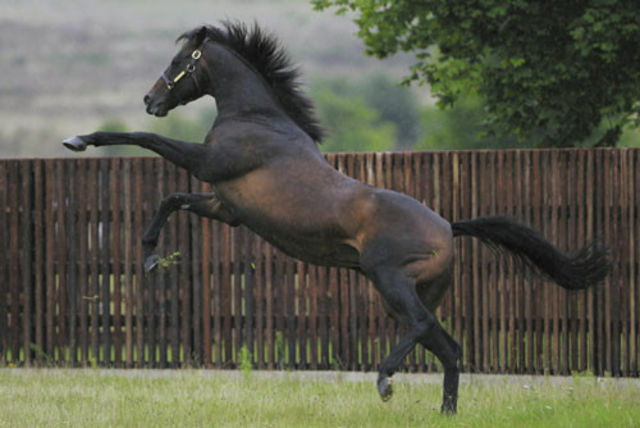 Invincible Spirit (eclipsed the record for winners in a given year, producing 42 individual 2 year-old winners in 2010), Desert Style (sire of Paco Boy) and Shinko Forest (sire of millionaire Tao Tao). Prepotent Green Desert, showing some of his spirit and vibrant personality! 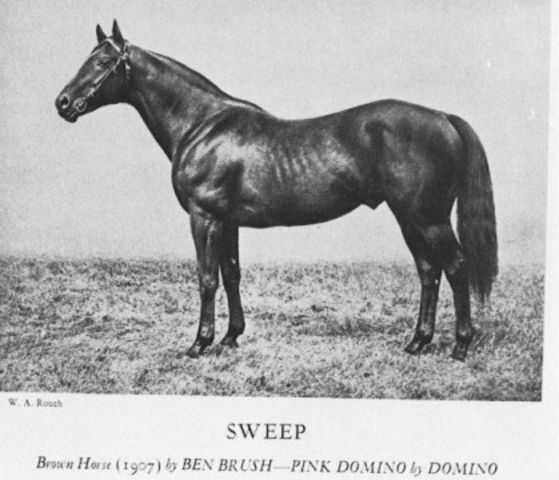 On top, Desert Sun’s pedigree also includes the likes of British champion Sir Ivor (1965) and the great producer Courtly Dee (1968) — who descends from the Nasrullah and Man O’ War sire lines — and was 1983 Broodmare of the Year based on the accomplishments of her talented daughter, Althea (1981). On the bottom, Desert Sun boasts Epsom Derby winner Crepello (1954), as well as some great French thoroughbreds, notably Pharis (1936) and Bois Roussel (1935). 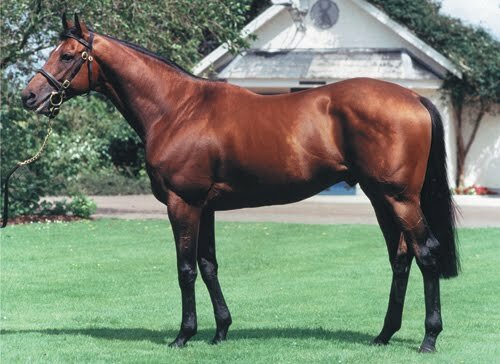 Desert Sun is a highly successful sire down under, the best of his offspring being the wonderful New Zealand-bred mare, Sunline (1995), who retired a multi-millionaire with dual victories in the Cox Plate and a number of other prestigious Australian Grade 1’s. 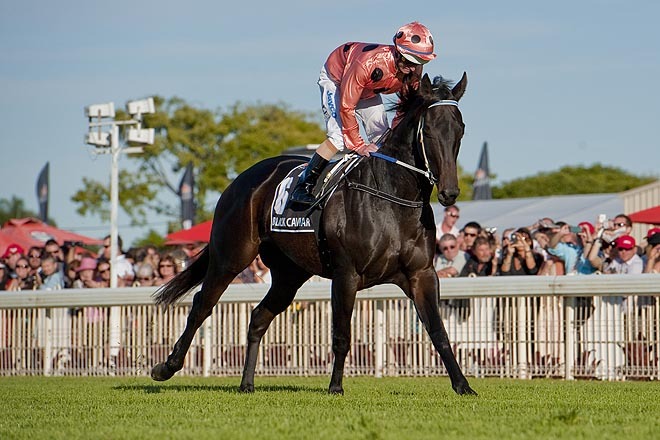 Black Caviar is without doubt his other most famous descendant. Nelly’s sire, Bel Esprit, another millionaire, is a son of Royal Academy (1987) by British Triple Crown winner Nijinsky II (1967) ex. Bespoken (1990), a daughter of champion sprinter, Vain (1966). Vain literally dominated Australian racing from 1968-1970, winning 12 of 14 starts and running a closing second in 2. 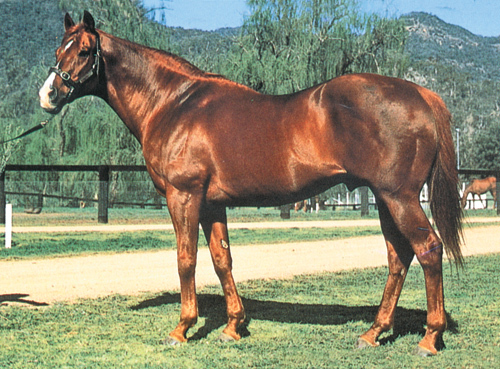 Vain, a beautiful chestnut with a determined heart, was Australian Champion Race Horse in 1969-70 and was also inducted into the Australian Racing Hall of Fame. 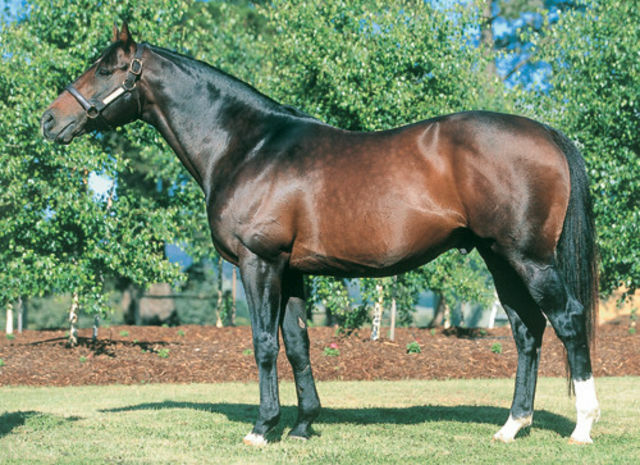 As a sire, he produced 44 stakes champions including Bel Esprit. 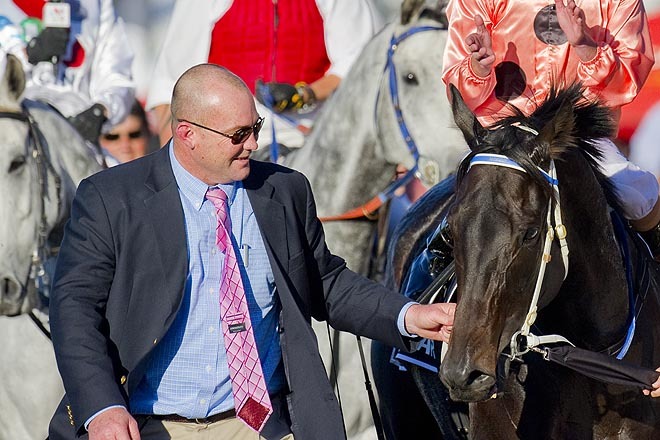 Black Caviar was subsequently sent to the stable of distinguished trainer Peter Moody in Melbourne. 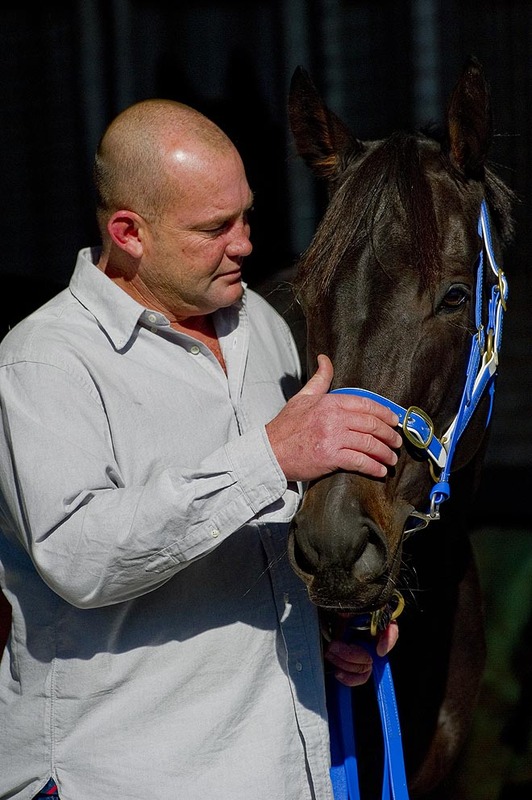 Moody grew up in outback Queensland, earning his training stripes as an apprentice to Tommy Smith and Colin Hayes and then serving as foreman for 10 years to Sydney-based trainer Bill Mitchell. 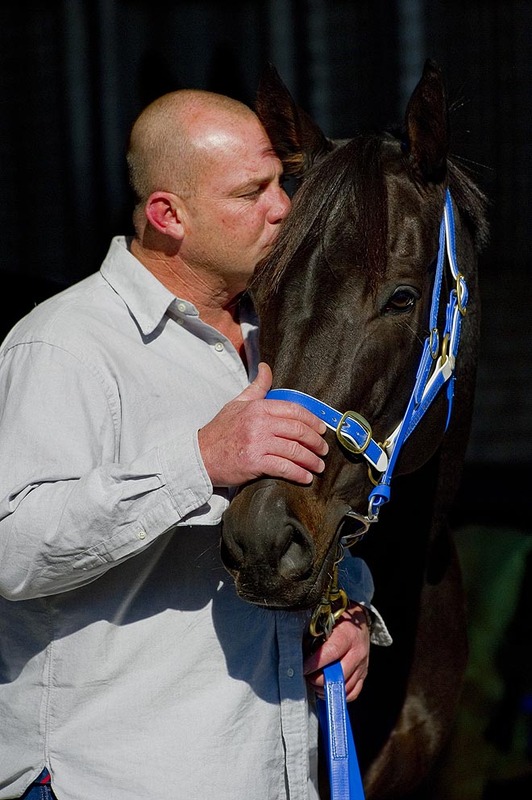 Moody then moved to Melbourne early in this decade, and went on to develop one of the strongest stables in the state with an enviable team of top class horses including 2009/10 Australian Racehorse of the Year Typhoon Tracy (2005). 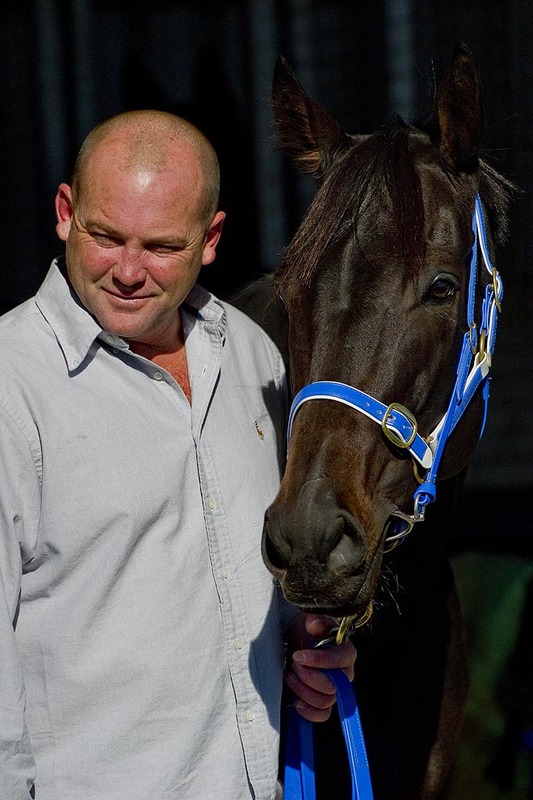 Moody claimed his first Melbourne Trainers Premiership last year, eight years after moving to Caulfield. 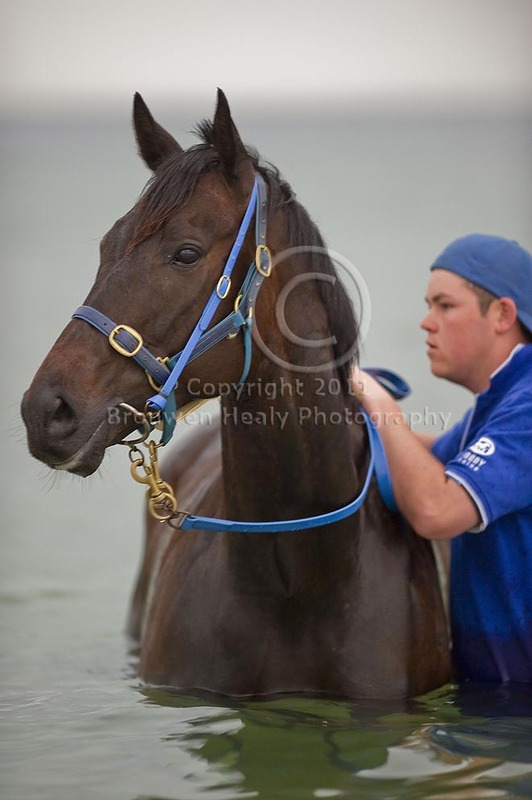 Other notable Moody horses prior to Typhoon Tracy have been Amalfi (1998), a colt by Carnegie (1991) who won the VRC Derby and was Moody’s first big winner, as well as other fine horses, including Ancient Song(1998) winner of the VRC Salinger Stakes, Sky Cuddle (2000) winner of the Emirates Stakes, Testifiable (2002) winner of the Malaysia Airlines SA Derby, Cinque Cento (2001) winner of the 2007 BTC Doomben Cup and Riva San (2004), a grandaughter of Sunday Silence and one of only 4 fillies to ever sweep the Queensland Oaks/ Derby double. And although several of these are fillies, it’s fair to say that Nelly is the best that Peter Moody has ever trained. 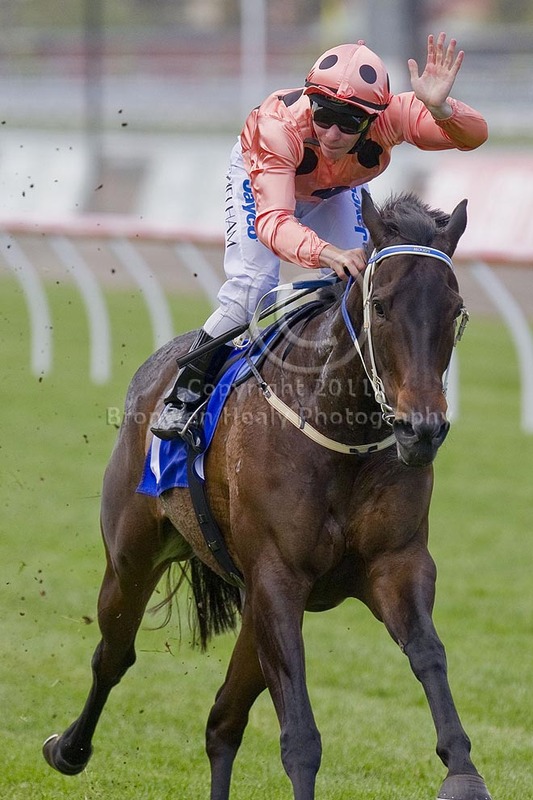 The filly started one other time as a 2 year-old, stretching out to 1200 metres and winning handily. 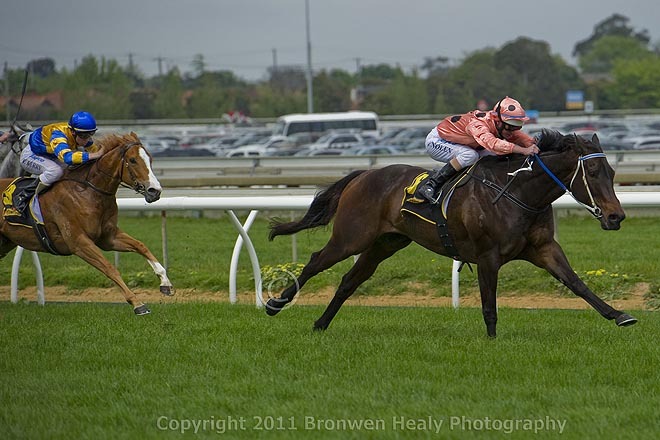 As a 3 year-old, Black Caviar raced and won three times, twice at G2 levels. But the filly also sustained injuries to her shoulder, after her second race where she had stumbled at the gate, and then a leg injury that was sustained after her victory in the G2 Australia Stakes against older horses. Her 3 year-old campaign, though short, saw the beginning of her winning relationship with jockey Luke Nolan, who has ridden her ever since. 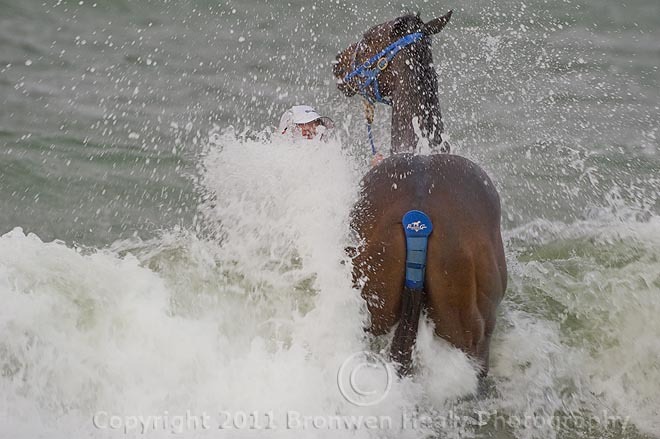 As she rested and rehabilitated for the opening of her 2010-2011 season, a time-off that included swimming as well as grazing and time with her “special friends,” Peter Moody and the mare’s connections were planning an opportunity for their undefeated champ to step up into G1 company at Flemington, in the Patinack Farm Classic. Plans for the Patinack were deftly embedded after two more G2 appearances. Once she had won those first two — and won them handily — “the heat was on” to see if the big, dark mare with the cool and sensible disposition could strut her stuff with top-form competition. Nelly relaxes with her special friends. Of course, she won the 2010 Patinack, much to the delight of her fans, trainer and connections. 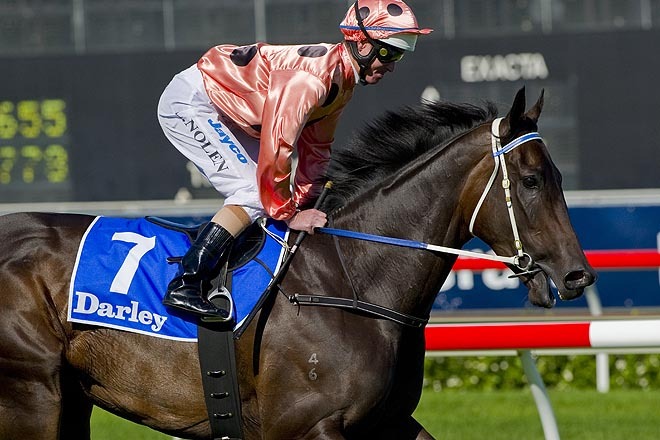 In the Coolmore Lightning Stakes, Black Caviar’s first start of 2011 and her second G1, the courageous Hay List (2005) a gelding who descends from Storm Cat and Seattle Slew, was back to take her on again. How good is Hay List? 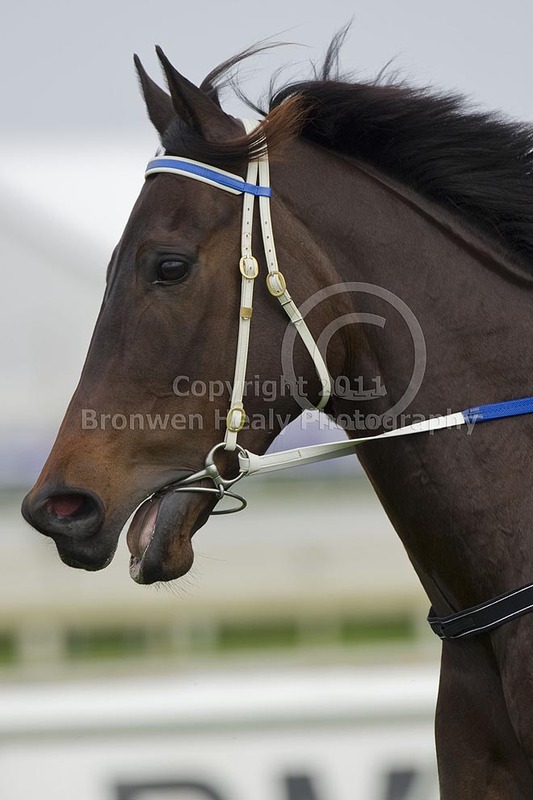 Good enough to have won 14 of 19 starts and placed in 3 by the close of his 2011 racing season. So it was that on the eve of the Coolmore Lightning, the stage was set for a battle worthy of Affirmed and Alydar, or Sunday Silence and Easy Goer, or Ferdinand and Alysheba…..
Hay List shows off his winning form, with Glen Boss (Makybe Diva's former jockey) in the irons. 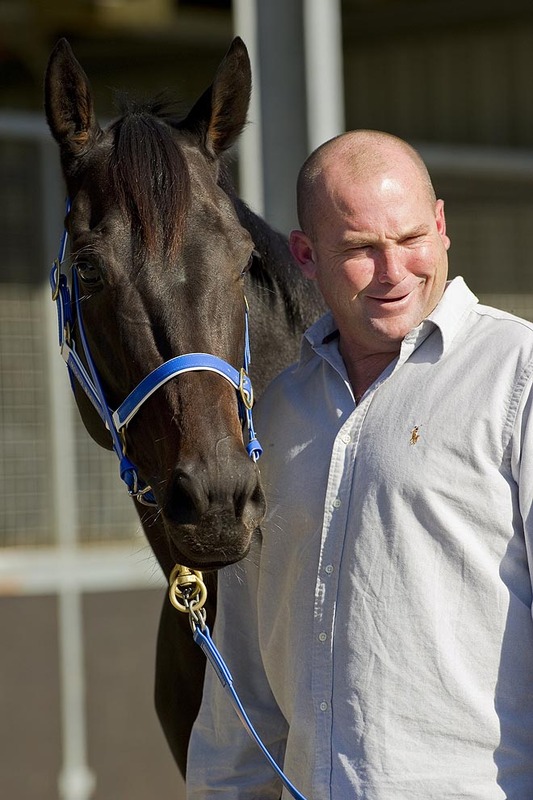 Peter Moody with his Nelly. 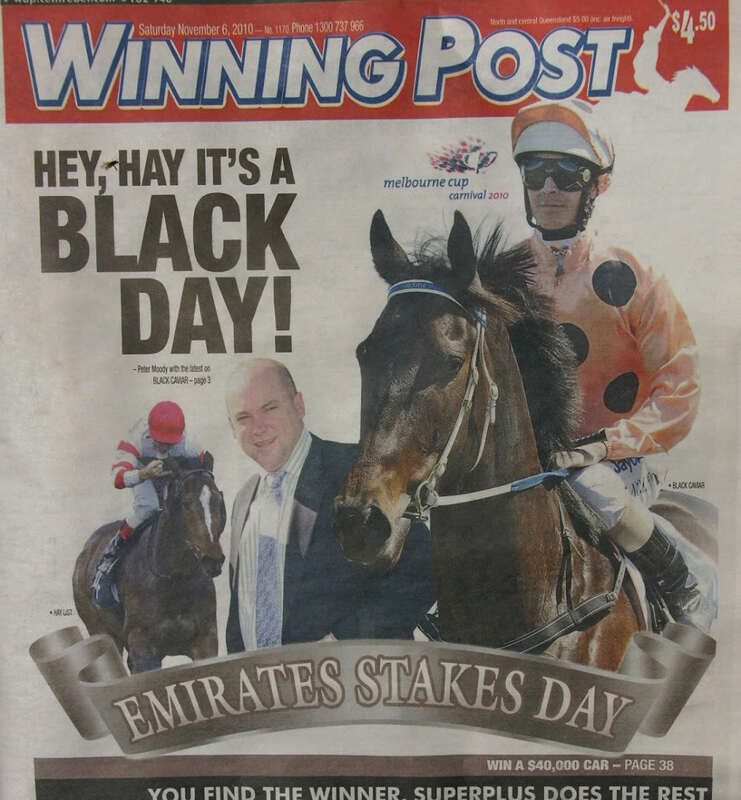 Black Caviar’s 2011-2012 season kicked off on October 8, 2011 with a win in the G2 Schillacci Stakes, followed by a 15th straight win in the G2 Schweppes Stakes. Moody wasn’t so much setting her on a backwards course as he was giving her the time to step up for the 2011 Patinack Classic, given her age. 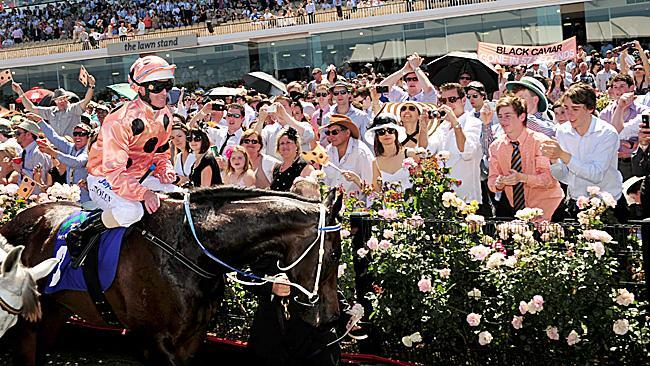 It turned out to be a shrewd move, since after her Patinack win, it became clear that Black Caviar was feeling the wear and tear of still another racing season. Her jockey, Luke Nolan reported that she just didn’t feel “quite right” to him, despite the win. Shortly thereafter, it was discovered that the champion had aggravated a muscle tear in her back. So at this writing, our Nelly is being given a much-deserved vacation. 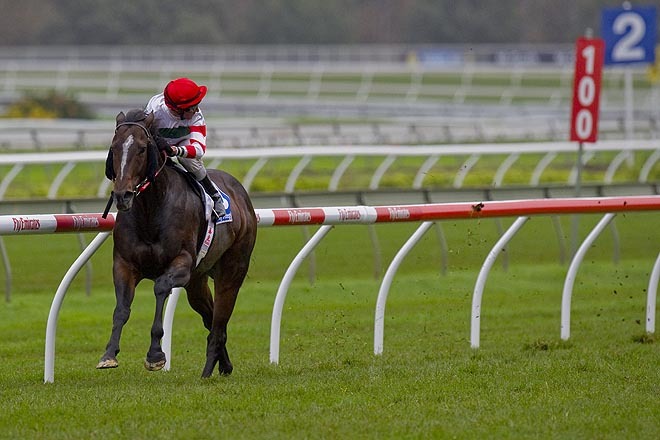 Assuming she’s back in form for her debut in the Australia Stakes on January 27, 2012, the central goal is to stretch her out beyond the familiar distance of 1200 metres in preparation for an appearance at Royal Ascot in 2012. 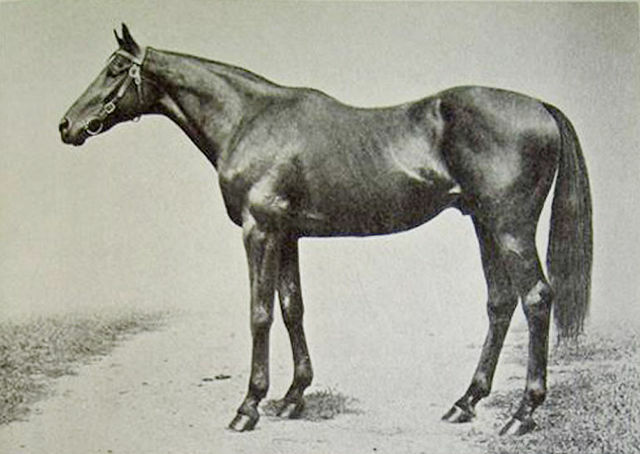 Looking at Black Caviar’s pedigree, she owes at least some of her sprinting prowess to Vain, while also inheriting similar potential from Crimson Saint (1969), a daughter of Crimson Satan(1959) and a Blue Hen who produced not only Royal Academy, but full siblings Terlingua (1976), the dam of Storm Cat and Pancho Villa (1982) by the mighty Secretariat. During her racing career, Crimson Saint was an accomplished sprinter, described by Wayne Lucas as his “favourite mare” of the day. Sprinting influences aside, Nelly’s ancestry over 4 generations indicates that she has what it takes to stay a longer course. 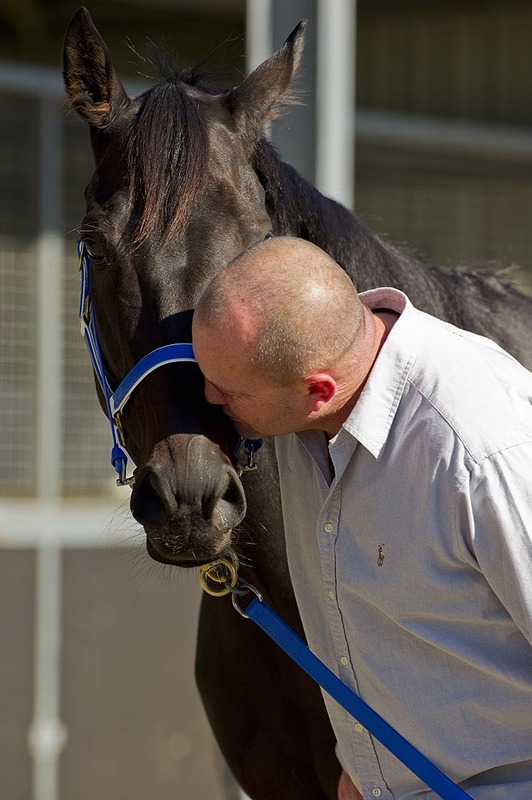 One thing is certain: Black Caviar’s trainer and owners will only do what’s absolutely best for their champion. She is respected and loved by all of those closest to her and they know she is a thoroughbred who will always answer a challenge, making it important that she is not asked to go beyond her own potential. Her return will likely dominate thoroughbred racing come January 2012 — and what a special, special way to kick off the new year! Ms. Nelly: We can't wait !!! These just in — taken by Bronwen Healy — NELLY AT THE BEACH. Enjoy! 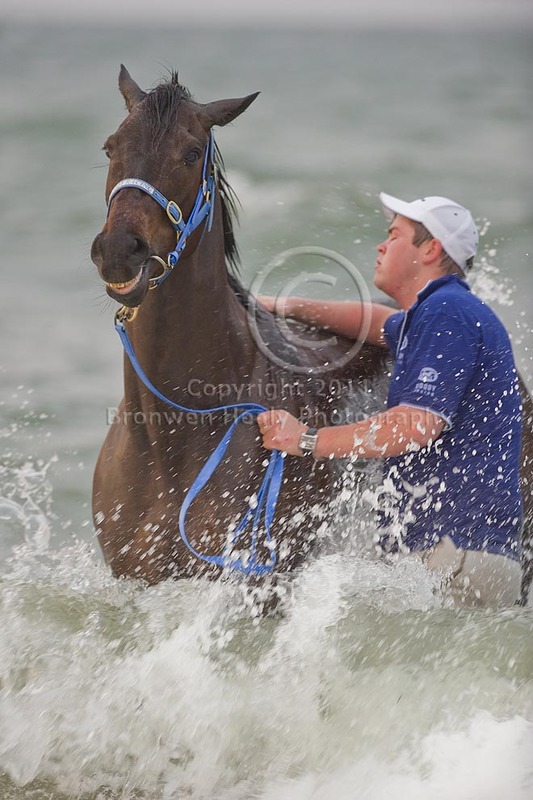 Black Caviar loves to swim, so the beach is about as good as it gets!